I can’t say I grew up hating salads, because I thought I loved them. Unfortunately, once I was an adult, I realized that I didn’t actually love my childhood salads; I loved drenching lettuce in really high-fat, high-calorie toppings and dressings and then eating those foods. A typical tasty salad of my childhood would have been iceberg lettuce topped with pre-shredded cheddar, bacon bits (or Bacos), chopped onion, chopped tomato, fried chicken, and 3 or 4 tablespoons of Kraft ranch dressing. That’s the kind of salad where you might actually be better off eating a burger. Every time I actually write out something like that it hits me that the fact that I wasn’t an enormous kid is a testament to the power of growth spurts and plenty of physical activity. As I’ve gotten older—as my tastes have changed and my expectations of food have changed—I’ve learned to make salads that I truly do love. Here’s what I’ve learned. 1. Local lettuce has an amazingly tasty flavor and tender texture. Finding a farmer’s market (and I mean a weekly or monthly fair where local farmers drive in to sell their goods, not just a store that happens to have put “farmer’s market” in its name) can be a boon to your tastebuds, fill your body with good nutrients, and help shrink your waistline, because local foods are so much fresher. They have a higher vitamin count than non-local foods, and they taste better with less adornment than ones that have been shipped thousands of miles. 2. In the winter, if local lettuce isn’t available, there are plenty of tasty salad alternatives from winter greens (such as kale and chard), winter fruits (such as citrus), and winter vegetables (roasted butternut, onions, turnips, etc.). 4. Some people will suggest that if you are watching your waistline, you should only top your salad with low-calorie toppings and dressings. I completely disagree. Now, low-calorie toppings can be really, incredibly excellent on a salad; they can even make a salad. I have thought before how perfectly some shredded carrots complemented the other ingredients in a salad I was eating. But a good salad is about balance and contrast—the sweet contrasting with the tangy contrasting with the salty, the rough contrasting with the smooth. Etc. You want to fall in love with eating salads, not force yourself to struggle through each one. You want to think, “What would make a good dinner tonight? Oooh, I want a _____ salad.” It’s hard to get that appealing balance of tastes and textures if you only use low-calorie toppings—for example, crunchy and mild, crunchy and mild, and crunchy and mild–topped with astringent pure vinegar, too. On the other hand, it’s also hard to get that balance if you top your salad with greasy fat, greasy fat, and greasy fat. If you’re using good, high-quality ingredients in your salad (and you should be—this is all about taking care of yourself), you want to be able to taste those ingredients, so you don’t want to smother the salad in a pile of high-fat dressing. But a salad with some fat in the dressing tends to taste way better and have a better mouthfeel, and, as a bonus, those of us with sensitive tummies can use a little alkalinity from oil to balance out the acid in the dressing. Personally, I prefer a ratio of 2 or 3 to 1 ratio when it comes to oil/vinegar (or other acid) in my salad dressings. And I prefer one or two higher-calorie toppings (nuts, strong cheese, seeds, dried fruit, gf croutons) combined with some lower-calorie, contrasting-flavor ones (onions, tomatoes, pickled beets) in each salad. Combinations like that keep me coming back for more. 5. When I say high-quality toppings, I mean use real ones. Local ones are going to taste better; organic ones are going to be better for you and better for the environment. Fry up a piece of bacon instead of using Bacos. (You can even fry it up and freeze it so you can take a single slice to crumble in your salad each day.) Make some homemade croutons (again, a freezer and toaster can simplify this process for quick meals). Buy real cheese from the cheese department, and grate it or cut it up yourself. (It just tastes better.) Strongly flavored cheese–like blue cheese, feta, and sharp cheddar—can provide lots of flavor even when you use less of it than you usually would. Creamy cheeses like goat cheese can provide a heavenly contrast. Make yourself an easy, homemade dressing in an old, washed jelly jar with a lid; shake it well, put it in the fridge, and use it up bit by bit over a week or two. (Have you ever looked at the ingredients in store-bought dressings? It’s horrifying how much fake stuff they can pack in lots of those.) If I absolutely can’t manage the time to make a homemade dressing (and we all have those times), I use a store-bought dressing with only real ingredients in it—nothing I don’t recognize and nothing with ‘partially hydrogenated’ anything in it, since I ate a load of trans fats growing up and I know that they could kill me. Here are a couple of my favorite salad meals/sides and easy homemade dressings that my husband and I have come to adore. This salad combines salty, sweet, sour, crunchy, and chewy together. We usually use this as a filling, satisfying side dish for quick meals. Make homemade poppyseed dressing, or use a good store-bought brand. (I love poppyseed dressing because it tastes creamy but involves none of that dairy that I can’t have.) Chop the apple into bite-size chunks. (Leave the skin on for extra fiber, or cut it off depending on your personal preference.) Put a small skillet on the stove and turn it on to medium heat. When the pan is hot, add the nuts. Toast them for 3-5 minutes, tossing them a couple of times, until their color begins to darken. 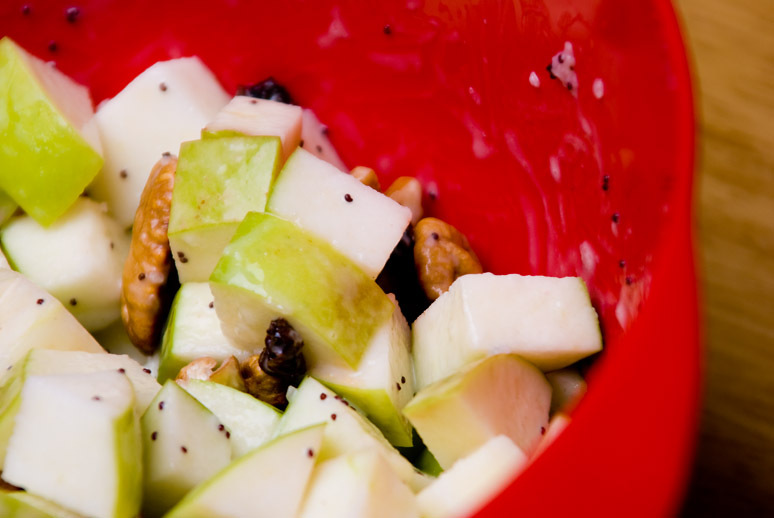 Toss the apple, dried fruit, pecans, and poppyseed dressing together. When we make this salad, we use whichever of the appropriate toppings we happen to have in the fridge at the time. I keep our fridge stocked with kalamata olives in brine and sundried tomatoes in oil just for this type of thing. You can also make this more of an Italian salad if you switch up some of your ingredients. Make dressing. Prep vegetables. Toss salad together or layer salad, depending on desired presentation. Sprinkle dressing on salad. Combine ingredients in a small, clean jar with a lid. Shake well. Serve or refrigerate. Lasts 1-2 weeks in fridge. Combine ingredients in a small jar with a lid. Put the lid on the jar, and shake well. Serve or refrigerate. Shake well before serving each time. Lasts about 1 week in fridge. Apples and nuts are a great combination … I need to make a salad! Love the photo your husband took of your eyes in your last blog post. What a great post! I have realized how amazing local winter greens are (thanks to my CSA). I have made some amazing salads over the past few months and I am excited I have some fresh greens at home to make a couple of more. I agree that low fat dressings always aren’t the best option. While there are some good ones out there (to buy or make), fuller fat dressings can be used in moderations. I love the fact that there are multiple ways to dress a salad. Wow, thanks! A great post. I have recently been eating more salads, in fact the last two days I have had romaine lettuce with chopped carrots, turkey chunks, raisins and dried cherries, and almonds, topped with a little salt, pepper, and basalmic vinegar. I really wanted to some creamy mild goat cheese to go with it. Your post has inspired me to play more with dressings, and reminded me how tasty fresh fruit is in salads. I love summer when there are fresh berries to be had on salads. There was one that I used to make with a sweet and sour poppy seed dressing and strawberries. Perhaps I will look for that recipe! Thanks for a great post filled with inspiration! I have a salad for lunch every day, which is 2/3 salad, 1/3 cucumbers, peppers, grapes, sunflower sprouts, mushrooms, or whatever else we have that is a vegetable that will go in a salad, with a dash of cheese and some salad dressing made out of real food. It’s to the point now where I just can’t imagine a day without it. I don’t feel as well when I don’t eat a salad every day. Of course, this coming from the person who had 1/2 a chicken breast and a pile of zuchinni and broccolini when we got back from our trip. I missed veggies while in New Jersey. 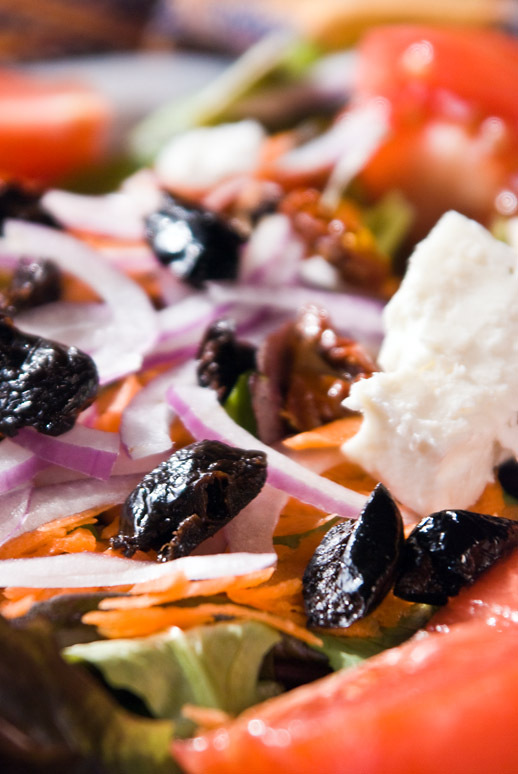 A Greek salad sounds good – I can’t wait until the summer again when tomatoes are in season! I agree with you on the fat necessary for dressings. I’ve been making one with several different oils lately and feel great: coconut oil, flax oil, hempseed butter, extra-virgin olive oil. The apple poppy salad looks heavenly. I will definitely have to add this to my repertoire. Thanks for sharing your wonderful salad tips! I made a huge salad at lunch today and used some dried figs, a Bosc pear, jicama, carrots, pumpkin seeds — among other random things I had on hand. Oh, and yes, spinach and lettuce. There’s no limit to what you can use on a salad. Mmmn. That apple-poppy salad sounds divine! Sounds delicious. I am really loving to learn salads, too, and to experiment more. Thanks for giving me more ideas! YUMMMM. I am going to try the apple-poppy seed salad really soon. I have apples at home to be used, too! I’m very into salads as well. My latest fave has been spring mix/gorgonzola/walnuts/tomato/neumann’s raspberry vinagrette. YUM. Thank you for your encouragement today on my blog. I really appreciate it. And needed it, too! Now I want to run out and get tons of fresh veggies and goat cheese to make a yummy salad!!! Sally, I liked your post so much! Salads can be interesting without having to be drenched in calories. I love adding cheese and fruit to my salads and these suggestions of yours are delicious! Great post! I was having similar thoughts just this week about how my tastes had changed over the years, especially salad. Thanks for the inspiration; I think I’ll make the apple poppyseed salad tonight. As always, I enjoy your posts.